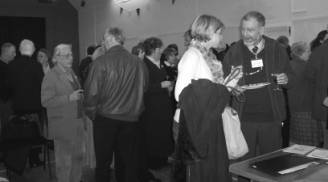 The Welcome to New Villagers evening, held in the Village Hall on Thursday 24 th February, was a lively and enjoyable event for both the new' and old' members of our community. General opinion was that it was an excellent idea and special thanks are well deserved by Linda Blundell who organised the catering (ably assisted by Ellen) and the Parish Council who provided the funding. Representatives of the Parish Church, local organisations and activities were able to recruit or encourage new participants and generally spread the word of what Longparish has to offer. It was pleasing to see some younger newcomers to the village and judging by the lively buzz of conversation they are happy to be here. Thank you to everyone who was involved and who came; such co-operation and enthusiasm makes our village such a good place in which to live. Are you the person I'm looking for? There is an opportunity to rent an allotment for this season. The Welcome Club still meets on the 3 rd Monday of each month at 2.30pm and welcomes all who would like to come to enjoy talks, slides, quizzes, outings, cream teas etc. It now meets in a new venue at Charles Dalton Court in Andover as the club had more members from Andover than Longparish. Gordon Gadsby is the Chairman, Joyce Gadsby the secretary and Muriel Hull the treasurer. Contact 01264 333803 for further details. Please plant a few extra seeds, take a few extra cuttings or pot up a few extra plants for us to sell at the May Fayre on 14 May. Please contact Maggie Barber on 720459 if you can help. Thank you. Thanks very much to the person who sent us £100 before we even started to prepare the sponsor forms. Our three runners are training hard for the London Marathon on 17 April. Alice Evans won the Bramley 20 mile women's race but has been frustrated by a knee injury. Her husband Jonathan equalled her time at Bramley and Jeremy Barber ran a good half marathon at Reading. Please sponsor them to help equip our playgroup. Forms should be available by the time you read this message . Annette Hobbs writes : I am a volunteer photographer with the Images of England Project. This project has been funded to photograph all the listed buildings in England. This is being done by volunteer photographers. My 'targets' are in Longparish and I wanted to let people know about the project. The project has been funded by the Lottery and is being run by English Heritage from the National Monument Record Office in Swindon. I have an id card I carry with me as I wander around trying to locate the buildings I have on my list which include quite a few barns. There is a website that the pictures will eventually be on - the address is www. imagesofengland.org.uk . There are plenty on there now of places already covered. We are expected to take the photos from publicly accessible land, but if this is not possible I will have to approach the landowner/householder to seek permission to take a photo from private land. There are shows around the country from time to time of photographs taken but nearest at the moment is in Chichester.